Joe Moses as Severus Snape is pretty much one of the funniest things ever. No matter what he says in that Snape voice, it is automatically HILARIOUS and his improv skills are top notch. We thoroughly enjoyed watching him interview Tyler Brunsman (and his perfect, white teeth. Did you know he whitens them by wearing his retainer? No lie!- How is that even possible? Retainers don’t whiten! ), fight over chairs with Jaime Lyn Beatty, and convince AJ Holmes to sing songs from the Little Mermaid. 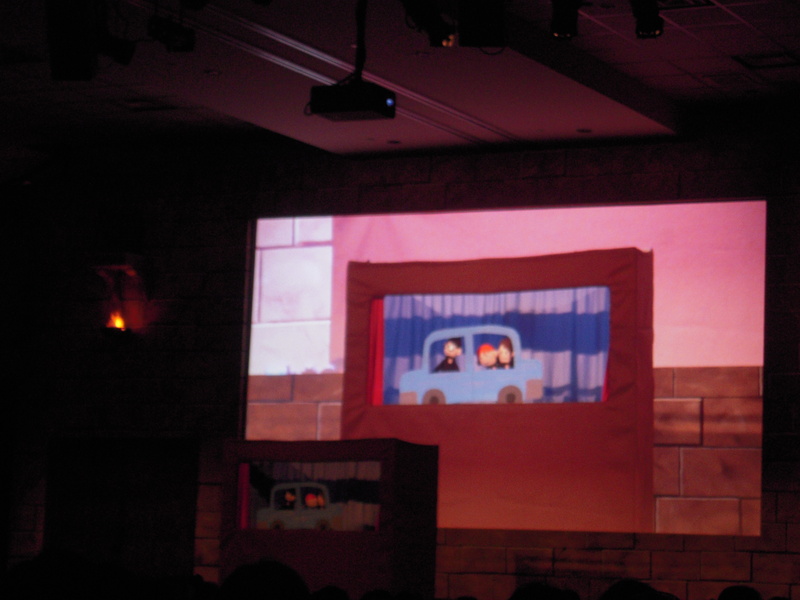 Potter Puppet Pals was next and completely exceeded all expectations. We have been quoting those videos since we were in high school and witnessing an extended live performance was out of control. 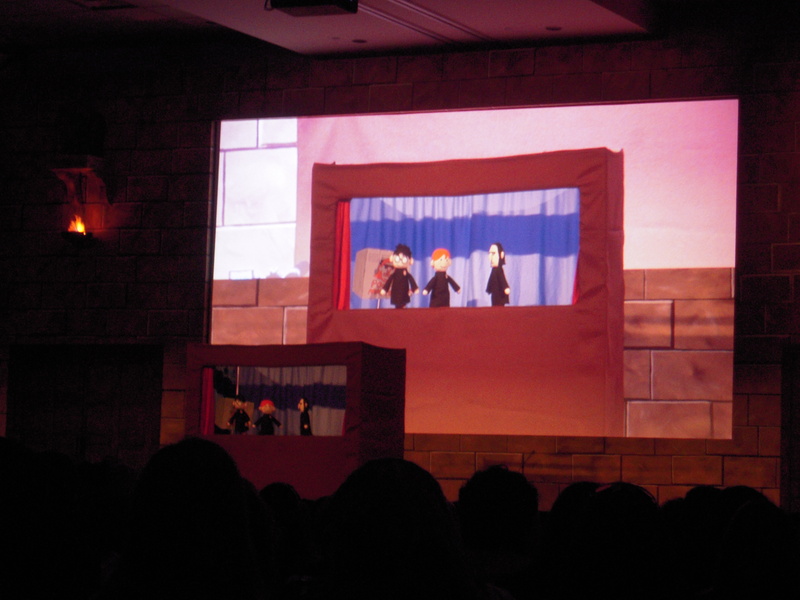 The show was in the style of the Life and Times of Mr. Harry J. Potter, in that it was a recap of his life when he went to die in the forest. Starting from the time he lived with the Dursleys (“Don’t mention magic in this house! I will paddle the magic out of you! Dudley, get me my magic paddle!”), to meeting Ron Weasley (and singing a song called “Wizard Treats! Wizard Treats!”), to stealing a flying car (“Which seat can I take Harry?”), and all the way up to The Forest Again and an eventual talk it out/hug it out with Voldemort (“Avada Kahugya!”). The songs were fantastic, seeing Dumbledore naked in person was more thrilling than it should have been, and we just adore when things end with a cornucopia of love! Oh – and did we mention THEY BOTHERED SNAPE?? Best ever. That afternoon, while hanging by the pool and drinking daiquiris (like they do in Twilight? ), we received a tweet from Scott asking what the “movie-haters” were doing. We informed him that we would be snarking and drinking (our usual game plan), and after the movie he showed up to join us at the bar. Maureen Johnson also showed up at one point, and Kelly tried to drunkenly convince her to keep LeakyCon’s walkie talkies . It didn’t work, and now the MJ death stare haunts Kelly’s dreams. Anyway, we had an incredible time with Scott, laughing and learning EVEN MORE secrets. So many secrets! Our hair is full of them! Once again we parted ways and we figured that would be the last we’d see of Mr. Westerfeld. When we tried to pay our bill, we were informed by the bartender that it was covered. THAT SNEAKY AUTHOR HAD PAID FOR OUR DRINKS. We had seen him pick up the check, but we assumed he was paying for his own gin and tonics, not our entire tab! We spent a moment exchanging dumbfounded stares before we realized that, bubbly as we were, it was clearly time for some karaoke. (Scott’s exit may or may not have had to do with the fact that they were setting up the karaoke machine…) Thanks again, Scott! We drank more and listened to some amazing karaoke (Stephanie sang Cabaret. The MC asked, “Who’s it by?” No.) and we even sang Adele at the top of our lungs with a bunch of other wizards before heading to the first night of wizard rock (or “wrock,” for short). Cassie-la was making a call outside, and when she came back she randomly ran into Scott Westerfeld AGAIN, and she profusely thanked him for picking up the bar tab. He said he enjoyed doing such things, especially in a SNEAKY manner, and asked if he could join her to watch some wrock. So there we were, yet again, hanging out with Scott Westerfeld, watching wizard rock, drinking, and having an overall AMAZING time. Sadly, after a while Scott left for real, letting us know that he was in the tri-state area a lot doing signings if we wanted to come and see him. We exchanged hugs and said goodbye. For the remainder of LeakyCon could not believe how nice and down-to-earth (for someone who writes about giant flying whales) a guy Scott Westerfeld is, and how much we missed running into him! Now about that wizard rock… Lauren Fairweather(/The Moaning Myrtles) and Justin Finch-Fletchley and the Sugar Quills were freaking awesome. And Cassie-wa and Stephanie really took off for the dance floor once Ministry of Magic took the stage. Despite some technical difficulties in the beginning, we jumped up and down a lot and absolutely loved it! Screaming “Take it! Take it!” at the top of our lungs is indeed one of our favorite activities (they even enjoy doing this in the car, and will play the song back until they get the timing exactly right). They were followed by The Remus Lupins – officially their last set. Alex tore it up and we sang all those “Ba da ba”s like there was no tomorrow. And then he ended with an encore of “Alone on Valentine’s Day,” which was the first Remus Lupins song Stephanie had ever heard, and Alex was, like, CRYING, and there was so much love! Absolutely fantastic. And exhausting! So much jumping! But so much awesome! And this concluded another day. On Wednesday, before falling asleep, we had declared it “the best day ever.” But then Thursday happened. I like how three of us commented (in one set of parentheses) on Tyler Brunsman/Lucius’ teeth.